The next foreign affairs Minister? L'Affair Bernier's Briefs, as I think I will hereafter call it, has certainly proven to be a far sexier scandal than Cadscam, the In & Out scandal, or even Mulroney-Schreiber. It was front page news for the third consecutive day in Canada, and has been grabbing international headlines, including a front page story in Italy. 1. The Liberals are alleging that CSIS met with Harper about Bernier and Couillard weeks ago. 2. The NDP are alleging that Bernier carelessly left his briefing files out on an airplane. 3. 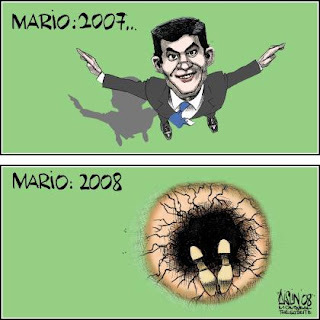 Don Martin floats the bizarre theory that Bernier was "set up" (to take the blame, not with Couillard). "Supposedly, the cabinet documents contained data about Afghanistan. Big deal," Peter Worthington scoffs in the Toronto Sun. "It's a challenge to imagine anything about our role in Afghanistan that could be damaging." 5. The Globe has the latest Cabinet Shuffle speculation, indicating it will be a "small" shuffle then talking about the need to replace Bernier, Toews, Emerson (at Trade), and Guergis, while promoting Jason Kenney, a Quebec MP or two, James Moore, and James Rajotte. Which is just cruel to the last two - why get their hopes up yet again, only to have Harper crush them? 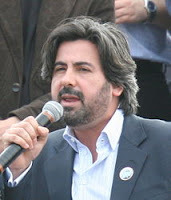 April 18, 2008: Maxime Bernier suggests that Afghan President Hamid Karzai replace the governor of Kandahar, setting off an international uproar. May 7, 2008: The "hey, hey, you, you, I don't like your girlfriend scandal" breaks wide open, with opposition parties pouncing on connections between Bernier's ex and biker gangs. 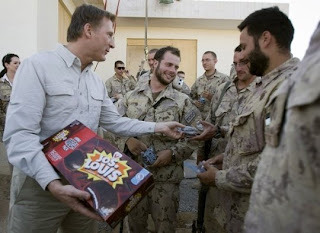 May 21, 2008: Bernier pledges that Canada will ship helicopters to Myanmar using an "available" CF-17. One problem - there are no available CF-17s. May 26, 2008: Bernier resigns after it is revealed he left confidential documents at Julie Couillard's house. In addition, foreign affairs drew fire for the handling of the Brenda Martin file, aid to China and Burma, and a gaggle of other screw-ups. Oh, and he got the name of the Haitian President wrong. Maxime Bernier has resigned as foreign affairs minister, after he acknowledged leaving sensitive government documents out in the open -- apparently at his former girlfriend's home. Sources told CTV News the documents included classified information for last April's NATO summit in Romania. One sensitive document contained details about NATO's military strategy in Afghanistan. Leaving your stuff at an ex's is always awkward, so I'd image when it's confidential NATO files, "awkward" doesn't even begin to describe it. So Bernier is out and the former Liberal David Emerson becomes Harper's third foreign affairs minister, with a shuffle expected this summer, at which point some other poor sucker will get the job. Although it's a difficult portfolio, I can't for the life of me imagine them faring any worse than Bernier, who has now given Harper one of the larger black eyes of his time as PM thus far. I just got into Calgary - here for the next few days and likely won't have much time to blog so I'm tossing out an open thread, on the topic of the Liberals possibly promising a carbon tax during the next campaign. Good policy? Bad policy? Good politics? Bad politics? The Bouchard-Taylor report on reasonable accommodation in Quebec, having already drawn a backlash from separatist leaders, was officially released today. The "abridged" report is 99 pages, making it about 96 pages more than I feel like reading, so don't expect any profound insight on this blog. Reading the media recaps (which is perhaps risky, since the report accuses the media of distorting and sensationalizing stories), it seems to dish out fairly reasonable advise, but little in the way of concrete suggestions for government action. 1. There seems to be a "don't worry, be happy" vibe in this report - things aren't as bad as in Europe and the media often overblow incidents. We can all get along if we just open our minds a bit more. Kumbaya spiritual being of my choosing, kumbaya. 2. The province should be proud of its Catholic culture but the government and courts needs to be more secular. 3. The report doesn't sound anti-French at all to me - it says immigrants need to learn French and the state should actively protect the language...I'm sure Marois and Dumont will find a way to spin this as an anglo assimilation blueprint, but it certainly doesn't read that way taken as a whole. 4. The government should use incentives to encourage immigrants to settle outside of Montreal. Makes sense. 5. There's nothing wrong with headscarves. 6. An effort should be made to help new immigrants integrate economically, in part by recognizing foreign credentials. The Star reports that Ian Brodie will be out this summer as Harper's chief of staff, and Guy Giorno will be in. Although it's just speculation, they sure do make it sound like it's a done deal and there have been rumours about this for quite some time. Is this related to don't-call-it-naftagate? I doubt it, but I suppose this could be a preemptive move if Kevin Lynch's investigation does point some blame Brodie's way. "Selling their children to Belgian stock brokers in exchange for carbon credits"
Hear, hear. Someone find this man a seat to run in! Yes, yes, I know he’s dabbled with a few (dozen) other parties since leaving the Liberals, but this could be the biggest comeback since Ed Broadbent! OK, I was with him on the US fighter planes shooting down UFOs. Believe me, I’m camping out for X-Files movie tickets. But referring to US planes as “our” planes…well, now he’s slipping into Ignatieff territory. “It is ironic that the U.S. would begin a devastating war-allegedly in search of weapons of mass destruction- when the most worrisome developments in this field are occurring in your own back yard. Come to think of it, using alien technology to solve the climate change crisis might be an easier sell than a carbon tax. ...and may the force be with you! Sad news, as Ted Kennedy is revealed to have a malignant brain tumour. Meanwhile, the neverending story visits Kentucky and Oregon tonight and (spoiler alert) Obama will clinch a pledged delegate majority, but Hillary will win Kentucky and fight on. Cherniak makes a good case for Hillary staying in the race until the end and I do think Obama's win at a contested DNC would generate a certain amount of excitement and create some momentum. However, the logistics of running a Presidential campaign are such that the Democrats simply can't afford to wait until late August to crown a nominee. Puerto Rico holds the final primary on June 7th. I think a fair solution would be for the super delegates to make their choices public soon thereafter, so that Obama's win can finally become "official" and he can focus on setting up a national campaign and attacking John McCain. The DNC will, I'm sure, give Hillary a prominent role at the convention and find some way to recognize the strength of her campaign, but to delay the inevitable by nearly three months for...well, I can't think of any good reason...just wouldn't be fair to Obama, to Clinton, or to the Democratic Party. UPDATE: Clinton takes Kentucky by an impressive 65%-30% margin. ...and Obama's looking good in Oregon - 63% to 37%, with 11% of the polls reporting. "The talk is that Maxime is going to end up at something fun and more at his level, like Revenue," one Conservative insider told The Hill Times last week. Snap! You'll remember that Bernier was assigned to the portfolio less than a year ago, after a series of high-profile bumbles by Misters MacKay and O'Connor. I'm not sure this is neccesarily a portfolio I'd want to get if a shuffle does happen this summer. If you were doing a report card on the performance of the Harper government in different areas, you have to think that Foreign Affairs would get their lowest mark. It's been one mistake after another in that file. Which kind of makes you wonder why the Liberals didn't think Afghanistan would be a winning issue when they had a chance to make it the issue earlier this spring. Like the dozen other scandlettes that hit the Harper Tories this spring, it looks like this one will quietly slink away. I do think that there are still a plethora of unanswered questions around this but Harper can just say "the RCMP has cleared us of all wrong doings" (even if that isn't completely accurate) and there's not much anyone can say to counter that. It's a shame because, unlike many of the other areas where opposition parties have been scratching for blood, it really does seem like there was something here. Rumours are flying that Vic Toews, Minister of Whatever-The-Hell-He-Was-Shuffled-Out-Of-Justice-To, will soon be appointed as a federal judge in Manitoba...or not. While some will cry about patronage, anything that gets Vic Toews out of Ottawa can't be that bad, so I don't have a huge problem with this. What it does mean is that, after nine months of non-stop election speculation, the media will soon move on to their second favourite topic - cabinet shuffle speculation! Quite a difference nine days can make, eh? John and Elizabeth Edwards have finally made their endorsement plans -- or lack of them -- official. On the eve of potentially decisive voting in Indiana and North Carolina, with political tensions at white-hot levels, John and Elizabeth revealed all in an interview with People magazine, of all outlets. The news in the interview is that they confirmed they will not endorse either candidate in the presidential race, because they are "saving their political capital for their own causes -- his, fighting poverty; hers, fighting for universal health care," reports, um, People mag. GRAND RAPIDS, Mich., May 14 (Reuters) - Former U.S. presidential candidate John Edwards will endorse fellow Democrat Barack Obama on Wednesday, a campaign spokeswoman said, giving a big boost to the Illinois senator in his effort to rally the party around his bid for the White House. Smart timing. Should make people forget West Virginia pretty quickly. There are at least a dozen things Ed Stelmach could do to clean up politics in Alberta. So what has he chosen to change? Fixed election dates? A citizen's assembly? More open FOIP rules? Campaign spending limits? A ban on corporate donations? A cap on individual donations? A more powerful auditor general? Independent ROs? More government resources for opposition MLAs? Nope. Instead he's gunning for a ban on third party advertising during campaigns - the one change that will actually help him (after the Albertans for Change ads attacked him last campaign). 1) Dan Cook on the varying delegate counts floating around. 2) Marjory Lebreton on why the concept of facebook is "dangerous". 3) Paul Martin is writing his memoirs, titled "Come Hell or High Water". Feel free to post your alternative titles in the comments section! 4) With no election likely this spring, the media focus has now turned from election speculation to...election speculation! The Hill Times floats a bizarre scenario built on the premise of Liberal public support gains this summer. 5) The Edmonton Journal is running a "rename the Alberta Liberal Party" contest. I personally believe they should just borrow a page from the Sask Party and rename them the...Sask Party! Judging from the number of Riders fans at Esks and Stamps games, it'd probably be a winner. No brussel sprouts for dessert if you don't finish your dinner! OSLO — Canada will be probed on suspicion of violating rules for registering greenhouse gases that are the mainstay of a UN-led fight against global warming, official documents show. Ottawa could be suspended from rights to trade carbon dioxide if found to be in breach of the rules by the enforcement branch of the UN's Kyoto Protocol. Greece was suspended last month, the first nation to face such a sanction under Kyoto. Just so we're clear. Canada is going to be punished for not meeting targets we no longer really care about meeting. And the punishment? Canada won't be allowed to buy credits - something we have no intention of doing - to meet a target we have no intention of meeting. ...well, not so much "fun" if you're a Clinton supporter. In an interview published by the French newspaper Le Monde on the weekend, Michaëlle Jean said she intends to speak about the importance of Canadian francophones who live outside Quebec when she meets with President Nicolas Sarkozy on Wednesday. “There are a million of them out there fighting to save their language and their culture,” said Ms. Jean, who is in France to underline the significance of this year's 400th anniversary of the founding of Quebec City. “And I will tell President Sarkozy, ‘Look beyond Quebec,'” she said. “I think France should go beyond Michaëlle Jean,” Mr. Duceppe said during Question Period. Look, I agree with Gilles the monarchy should be scrapped. And since no one in Canada knows who is actually in the "Quebecois nation", I guess Gilles' interpretation that it doesn't include francophones outside of Quebec isn't more asinine than any others out there. But can anyone explain to me what he has his hairnet in a bunch over here? As I read the Globe article I kept expecting some offensive comment to come out but...nada. The Canadian Head of State is promoting a big event for Quebec City? Sounds good to me. She says the million francophones living outside of Quebec shouldn't be ignored? Sounds reasonable. I'm really at a loss to explain what set Gilles off on this one. 1) The Liberals, NDP and Greens would "divvy up" all Alberta ridings and agree not to run candidates against each other. 2) The parties would maintain their autonomy and run their own election campaigns but would agree on a list of "core priorities to act upon if they are able to form a government after the next election." 3) If they form government, the parties would look at major electoral reform, possibly adopting a system of proportional representation for future elections where political parties would receive a percentage of seats based on their percentage of votes. While this proposal might lead to a larger opposition, it sounds like a recipe for perpetual opposition to me. I’d also suggest that “giving up” on a large chunk of ridings isn’t the best way to build up a stronger grass roots organization. Even if you assume that 1 + 1 + 1 = 3, a “united alternative” would have won…wait for it…19 seats this March. Out of 83. Outside of Edmonton, the NDP and Greens (and in many ridings, the Liberals) just aren’t in the game and vote splitting isn’t the issue. Sure, this strategy would ensure a nice opposition caucus from Edmonton year in and year out but to actually form government there needs to be a more appealing alternative to voters. And my hunch is that a “giant left wing alliance” isn’t going to appeal to many voters in Alberta (then again, I have been away for a while - maybe things have changed). There may be some benefit in trying this out in 4 or 5 Edmonton ridings but, even then, when (if?) voters decide to toss the Tories, Edmonton won’t elect a single PC MLA regardless of how the vote is being split. It’s good to see people bringing forward different ideas and I’m glad to hear that “everything is on the table” from an ALP perspective. But this idea would be one step forward and three steps back in my opinion. Since I’ve been bitching about the Liberal Party’s fundraising problems for ever and ever, it’s only fair to help them publicize this latest initiative. Meet “The Victory Fund” – a stab at trying to get those small time donors the CPC have so effectively recruited with their “give us 20$ because the CBC is eeeevil” direct mail campaigns. Stéphane Dion and the Liberal Party need your help and that of all our members to defeat Stephen Harper and build a strong Liberal Party. Your contribution of as little as $10 per month – the equivalent of just $2.50 per month after your year-end tax rebate (that’s the price of a coffee and muffin!) – will make this happen. $2.50 for a coffee and muffin? Maybe the Liberals are catering to the Tim Hortons, rather than the Starbucks, crowd! “But what’s in it for me?” I’m sure you’re asking yourself. Victory Fund supporters will be invited to participate in 120 hours (each year) of live online dialogues with senior members of the Liberal caucus and other key party figures. In addition, at the upcoming biennial convention, there will be a Victory Fund reception area, lounge and preferred seating. Although the thought of someone wanting to chat on MSN with Garth Turner for 120 hours is a bit disturbing, I’m all about preferred seating so I’ll definitely be signing up, and I encourage other Liberals to as well. It wouldn’t surprise me if Liberals are starting to view by-elections like a trip to the dentist – every six months you get a bit of discomfort…with the possibility of a lot of discomfort if they find a cavity. And there’s a toothache right now, with another quartet of by elections looming. Asuming, of course, that there’s no spring election. The two in Quebec should go according to script. The Bloc took Saint Lambert by a 2 to 1 margin last time, and Marc Garneau should launch off in Westmount-Ville-Marie with no problems (rule of thumb: any riding with the word "westmount" in it is still safe in Quebec). With both the BQ and Liberals struggling in Quebec, it will be interesting to see how much the margins of victory shrink but I wouldn’t expect anything too earth shattering. In Don Valley West, John Godfrey will be stepping down July 1st, which kiboshes doing all four by elections in June. Rob Oliphant won a nasty nomination for the Liberals, while John Carmichael, who lost by 20% to Godfrey last time out, will be the Tory nominee again. Again, I’d expect a drop in Liberal support due to the incumbent leaving, but it should be a hold. The most intriguing of the four is Guelph, following Brenda Chamberlain’s official resigning on April 7th. That means Harper can call the by election anytime between now and October. If I were Steve, I’d be targeting June since the students won’t be there, and it could generate some momentum going into the summer break. Of course, doing all four at once would be neater, he’s shown a willingness to delay by elections before and, there’s the somewhat counter intuitive theory that Harper doesn’t want to win any more by elections. 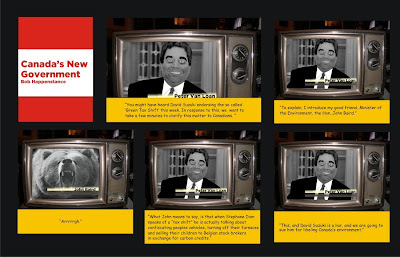 Liberals: Frank Valeriote, a lawyer with lots of community involvement. Conservatives: Gloria Kovach, a 16 year city councillor and, judging from her picture, member of Deborah Grey's motorcycle gang. 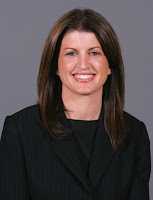 Kovach's nomination generated a fair bit of controversy after the original CPC candidate was removed. NDP: Tom King, a University Professor and creator of CBC radio show "the dead dog cafe". Greens: Mike Nagy, who has run twice for the Greens before. "Born on third base. Stole Home." A few random Sunday links"
1) The "six words for Bush" blog asks readers to submit 6 word memoirs about W. My favourite is the title of this post. 3) Big City Lib with the latest twist in the In and Out scandal. With a neck and neck race for the democratic nomination, the usually insignificant Guam primary is now...slightly less insignificant. Barack Obama has become the first Democrat to ever set up a campaign office in Guam (Republican Rudy Gulliani, of course, set one up in January as part of his "Florida and Guam" strategy), while Bill Clinton has been talking up the importance of Guam. It's nice to see that no region is too small to pander to! It's difficult to say who has the edge in this primary, given that so little is known about Guamanian politics. Having dodged gunfire during the Battle of Guam in WW2, I'd expect Hillary to have the edge, but who knows? UPDATE: It's Obama by 7 votes! 50.1% to 49.9%. 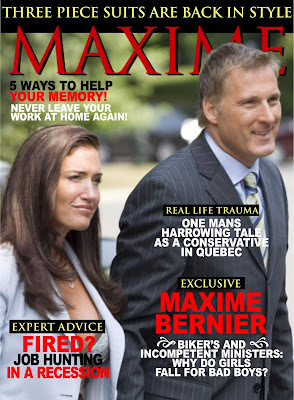 First Maxime Bernier takes over Peter MacKay's job in foreign affairs. Then he ends MacKay's 9 year reign as the "sexiest MP" on the Hill. Anyone know who Belinda is dating these days? For the women, Rona Ambrose was voted sexiest MP - and here I'd thought she was invisible. The NDP's Peter Stoffer takes this one, ahead of Monte Solberg and Merv Tweed. I don't know much about Merv Tweed, but I can't imagine someone named "Merv Tweed" not being funny. Stoffer is the "Frasier" of the Hillies, winning a slew of awards this year - best constit MP, throws best hill parties, and most generous to staff. The worst sense of humour list is no surprise - Stephen Harper, Stephane Dion, Ralph Goodale, and Peter Van Loan. With Myron retiring, someone else will finally have a chance to win this one but, until then, it's no contest. Iggy and Harper in the house. Harper and Iggy out of it. Meanwhile, Prentice and Baird tie as the best Cabmin in QP, followed by Van Loan and MacKay. Stephen Harper, which makes sense given that he doesn't let anyone else in his caucus talk. Harper also takes hardest working - since he's basically running and entire party and country by himself, I'd say that's fair enough. And he completes the hat trick with "best fundraiser" - it's shocking that a Liberal didn't win that one, eh? Pierre Pollievre edges out Garth Turner and Ruby Dhalla. Hey, it's Pierre Pollievre again! Runner up to Ignatieff. Pierre is left off the "best up and comer" list though (for obvious reasons some might say) - instead, it's Navdeep, James Moore, Mark Holland, and that young wipper snapper Bob Rae. 6 names make the list due to ties: Baird, Pollievre (again! ), Turner, Iggy, Holland, and Layton. It's Pablo Rodriguez and Helena Guergis. Why don't we just declare Stephen Harper "supreme emperor" and get it over with already? OTTAWA–Ottawa's financial watchdog says she won't go along with draft government rules that she says would undermine the independence of officers of Parliament like herself. Auditor-General Sheila Fraser found allies yesterday who condemned the Conservative proposal, which could mean that Parliament's officers must vet their public statements through a wing of the Prime Minister's Office, as an unprecedented attack on the independence of the officers, who are supposed to work at arm's length. The draft proposal would lump in Fraser, along with other officers of Parliament such as the head of Elections Canada, and the privacy, information and ethics commissioners with all other government departments and demand they get high-level approval before speaking out. At least the Tories recognize that picking a fight with the incredible Hulk of Canadian politics (you wouldn't want to see her angry...) isn't a good move and decided to quickly backtrack/clarify their position. The Prime Minister is often compared to George Bush. His role model (however) may be a different republican. Te Enemies List now includes Elections Canada. Mr. Speaker, we know the Prime Minister loves power, we want to know why he hates HIS own government.